Unlike woman who can buy 100 pairs of shoes that are the same, I buy shoes that are different. 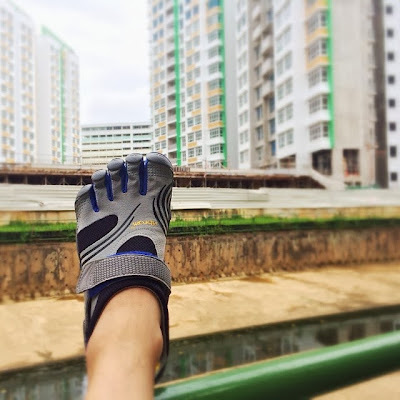 This time, I bought a pair of Vibram’s Five Fingers, a barefoot running shoe that looks VERY different. Five Fingers is different from other running shoes because it encourages frontfoot strikes rather than heel strikes. It is like running barefoot, where landing on your frontfoot is the only natural thing to do. And like other minimal footwear, your foot will ‘feel’ more, as your sensory nerves are not cushioned. In other words, more pleasure. After my first (short 1.5 km) run with it, my calf is aching. That’s normal. Looks like I will have to slowly adapt. Interestingly, I also tried running backwards, which feels more comfortable than forward..